When you need a break from the busyness of the holiday season, it’s nice to catch up over a delicious but deceivingly simple make-ahead brunch. I used to think crepes were too difficult to make home. I thought of them as something special to be ordered when dining out. But I’ve discovered that although the first crepe often ends up in the garbage, a batch of crepes is easy to make and impressive to serve guests. You can make the crepes ahead of time and store them layered between wax paper in the refrigerator for up to 2 days (or freeze). As well, you can make the salmon mixture ahead of time and just heat before assembling the crepes. This Sauvignon Blanc from New Zealand is fresh and crisp and takes away any fatty mouth-feel from the salmon and crepes. It is from the Marlborough region, which is well-known for its Sauvignon Blanc. Salmon and dill are star-crossed lovers in the food world. They go together like shoo bop shoo wadda wadda yipitty boom de boom. And dill makes a nice garnish. In a blender, combine all ingredients and whiz until combined well. Let rest in the refrigerator for 30 minutes to 1 hour. Heat a non-stick 8-inch pan over medium heat. Spray with cooking oil. Pour about 2½ tablespoons of batter on the pan and spread it thinly. Cook for about 30 seconds and then flip and cook the other side for about 15 seconds. Transfer to a wax paper-lined plate. 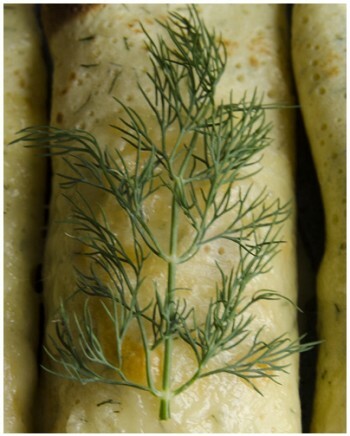 You can make the crepes ahead of time and wrap them in plastic wrap and store in the refrigerator for up to two days. Makes about 15 six-inch crepes. You will only need eight crepes for this recipe, but you can freeze the others for another time. Cook the salmon. You can fry, broil, bake or barbecue the salmon until cooked through. Heat a pan over medium heat. Add the butter. When the butter begins to foam, add the shallots. Cook until translucent, about 5 minutes. Then add the flour and cook for about 1-2 minutes. Add the wine and let reduce by half, about 5-7 minutes. Add the cream, dill and cooked salmon. Cook until the cream thickens. Season with salt and pepper and set aside. You can make this ahead and store in the refrigerator. Line a baking sheet with parchment paper. 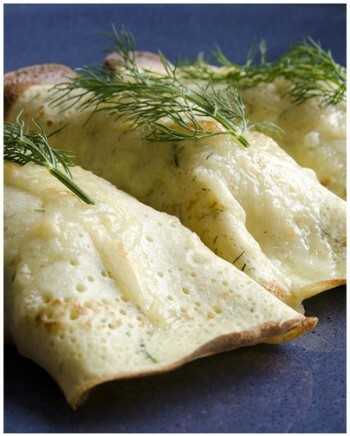 To assemble the crepes, take one crepe, spoon the filling along the center and sprinkle with cheese. Fold the crepe over and place on the baking sheet. Repeat for the remaining 7 crepes. Bake for about 10 minutes or just until filling is hot and the cheese is melted. Serve immediately. As a perpetual student in the kitchen, I’m always buying a new ingredient at the market, reading a cookbook, collecting food props for photography or browsing the kitchen gadget stores. After the encouragement of winning a recipe contest when I was 10 years old, I have been collecting recipes ever since. Now I write about my food experiences on my blog. I also enjoy the table-side of the kitchen as a restaurant reviewer for a local commuter newspaper, and I freelance as a food editor for a new magazine called Taste & Travel. Recently, I completed Basic Cuisine at Le Cordon Bleu in Ottawa.